National Flag of the Philippines: I have observed that there is NO National Flag of the Philippines displayed at the upper walls of the Ice Olympic Stadium despite the fact that there had been four (4) Filipino Runners who have finished the race or for the the fact that our country was always represented in this event for the past four (4) years. If there is a way, I will ask one of the future runners for this event to bring one flag of our country and I will buy one for this purpose. The flag should be given to the Race Director/Organizer to be displayed at the Expo and Start & Finish Area. Local Bus Schedule: It is highly advisable to know the schedule of the local Dolomiti Bus through their website or through the Schedule of Trips posted at the Town’s Bus Terminal. An iPhone or Google Application can be downloaded to one’s cellphone to find out their daily trip schedule and buy a ticket Online or simply go to the Bus Terminal to buy ones ticket at the counter. 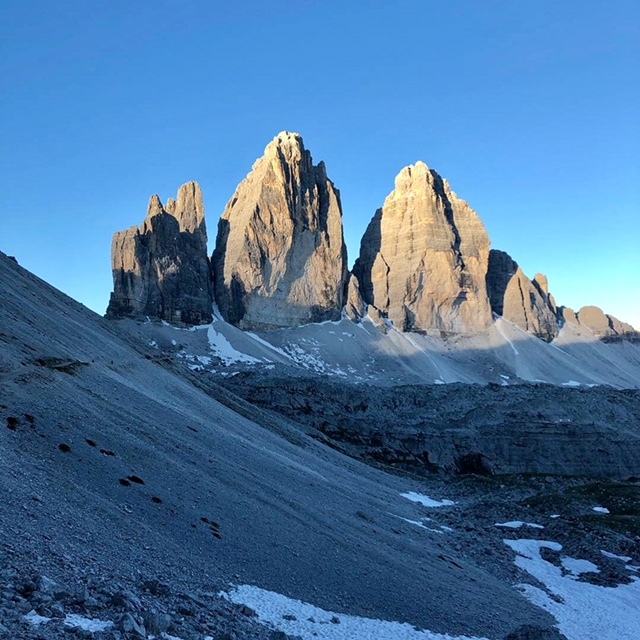 Visit Tri Cime Di Lavaredo: The bus that leaves to the popular destination in the Dolomites leaves the city early in the morning (usually 7:00 to 7:30 AM) to be able to return back to the city in the afternoon. Prepare 20 Euros for the Ticket to enter the Park at Tri Cime Di Lavaredo (separate from your Bus Ticket/Fare). It is highly recommended to visit this place if a runner has the time. Hotel Accommodation: I highly recommend the Dependance Hotel Corona, the place where I stayed, as Stefano, the Hotel’s Manager and its Staff are very friendly and accommodating. Most of the runners stayed in this Hotel. You only have to make your reservation ahead of time, preferably, once you are picked in the lottery and have paid your registration fee. Carry Some Rice From The Philippines: If ever I would go back to Cortina and run the Lavaredo, I would bring my Camping Cooking Gear and and maybe, 1-2 Kilos of Rice in my Check-In Luggage. I have observed that “Rice Balls” as my main source of Nutrition is very appropriate in this event. I can not live without Rice as part of my meal even if I brought with me lots of Lucky Me Instant Noodles to Italy. For 12 days of my stay in Italy, I was eating bread, pasta, spaghetti, and fruits but nothing beats Rice as my main source of Carbohydrate. I was able to reduce my weight despite my daily Breakfast Buffet at the Hotel to about 5 pounds which is maintained up to this day. 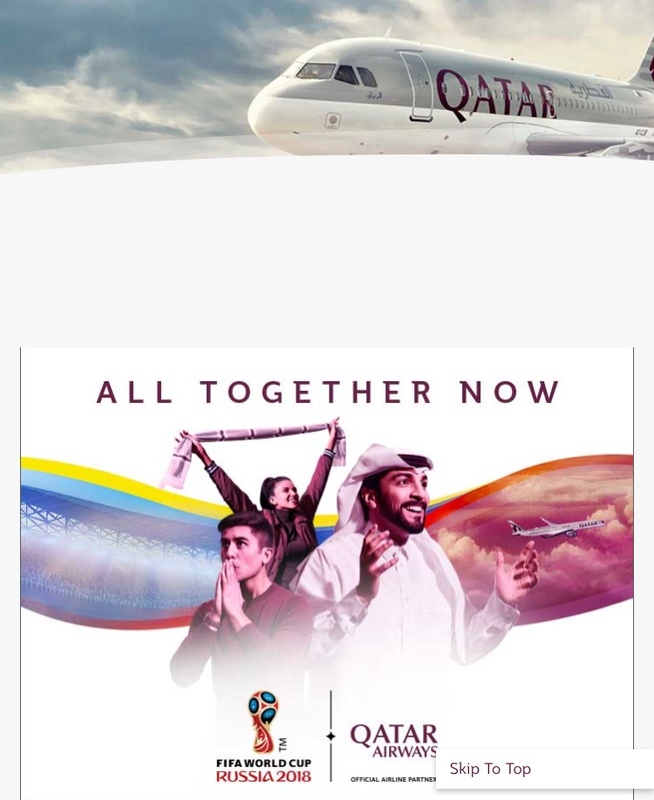 Flight Carrier: I have been traveling to Europe, since last year, through Qatar Airways. The fare is cheap as compared to the other Airlines if you buy your tickets ahead of time. 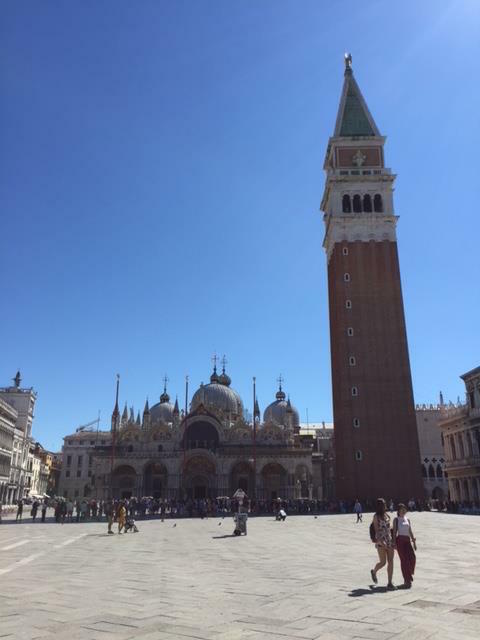 The trip to the Marco Polo International Airport in Venice, Italy would take a maximum of 22-23 hours with a stop-over at the Hamad International Airport in Doha, Qatar. The round-trip ticket costs me P 35,000.00 more or less. 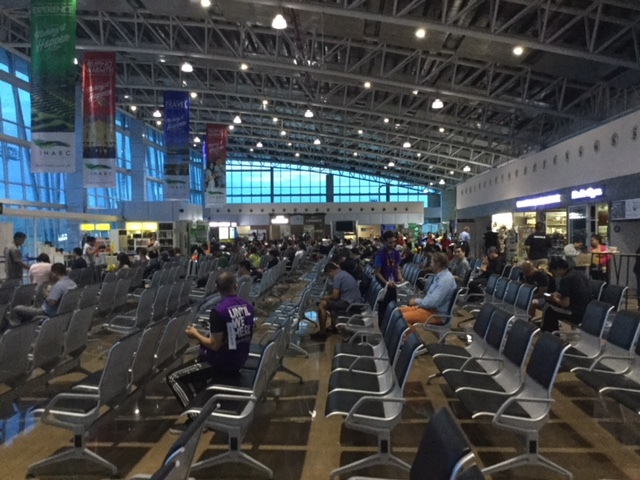 (Note: Do not depart from the Clark International Airport, it collects a Terminal Fee which is supposed to be FREE or had been paid once you buy your airline flight ticket fare). 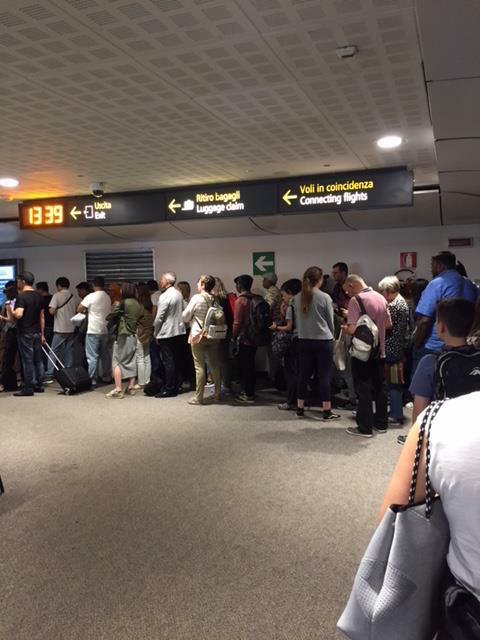 Bus Transfer From Marco Polo Airport To Cortina & Back: There are so many Buses to choose from as posted in the Event’s Website. You can book and buy ticket through Online at Cortina Express; FLIX Bus; or ATVO. I booked and bought my ticket through FLIX Bus in going to Cortina but I ended riding the Cortina Express. 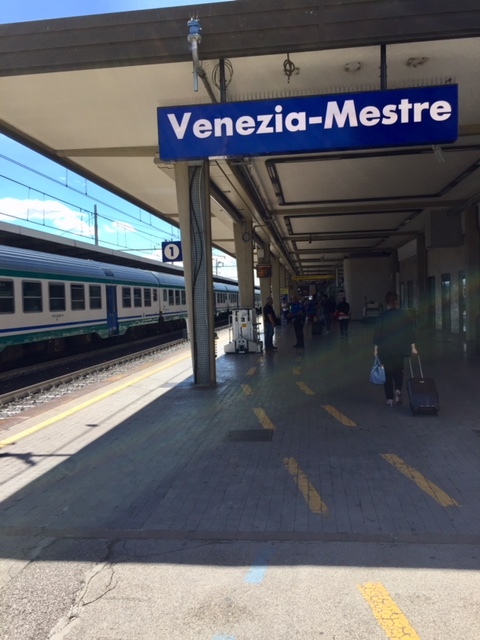 On my way back from Cortina to Venice, I took the ATVO Bus. 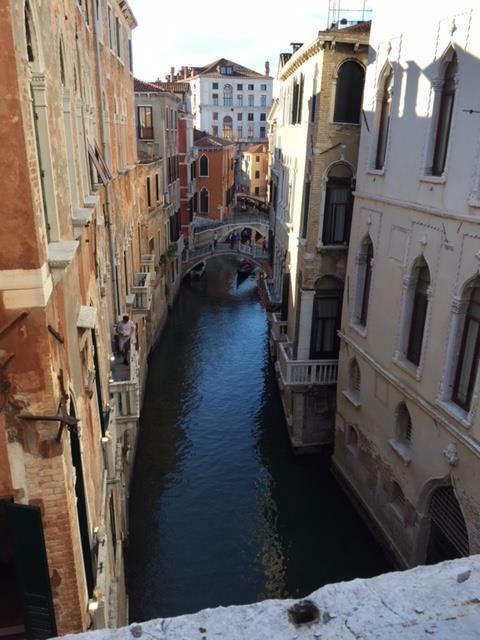 Always remember that there is only One Trip in the morning and One Trip in the late afternoon in going to Cortina; and the same trip from Cortina to Venice. I suggest that you should buy your tickets On Line as early as possible. Each Bus ticket (One Way) costs from 14-18 Euros. Food & Accommodation In Cortina: Because I have a Free Breakfast Buffet in the Hotel, I only eat one meal outside of the Hotel for my early Dinner which would cost me, at least, 6 Euros (Panini) or 9-11 Euros (Hamburger without French Fries) or 9-11 Euros (Whole 8-inch Pizza). Extra food intake would be some fruits (bought from the grocery); Instant Noodles I brought from Manila; 3-in-1 Instant Coffee and SkyFlakes from Manila. Shopping For Running Gear/s: You can buy some of the Mandatory Gear at the Expo after your Race Packet Pick-Up at the Ice Olympic Stadium. Always ask for discount from the Sales Person. I was able to buy my Salomon Bonatti Waterproof Pants with a 50% discount! After the event, there are sports brands and Sports Stores that are very popular in Europe but unknown in Asia and USA which are on Sale for 20% discount on most of their products. If you look closely on their material and quality of work, they are much better than the popular brands. I must admit, I bought some of these unpopular brands and be able to use them in my next year’s adventures in Europe. 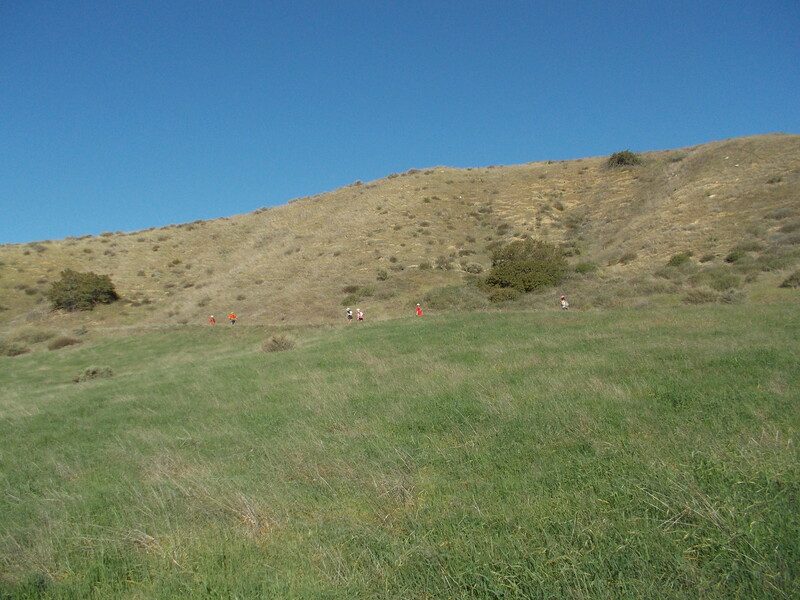 Training & Preparation: Trail runners who would try to participate in this kind of event must have the necessary ITRA points, which means, that a runner should have the experience to run in mountain trail events. 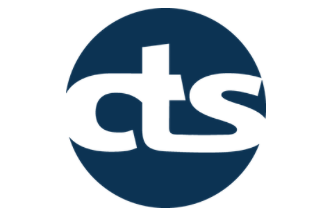 I prepared for this event for 6 months through the Coaching Services of the CTS and I am satisfied of what my body is capable of. My old age is taking its toll to my overall performance as compared in my past running events where I have participated but I feel like I am healthier and more rested this time. As my Coach would say, the races that I’ve selected to join for this year are not the “EASY” ones but they are categorized as one of the hardest ones in the international ultra trail events and this is one of the reasons why such races are considered as part of the “Ultra Trail World Tour” Series. However, it would had been different if I’ve done these races when I was ten years younger. It is through perseverance, patience, discipline, and dedication that in the future, I will be able to finish these races. 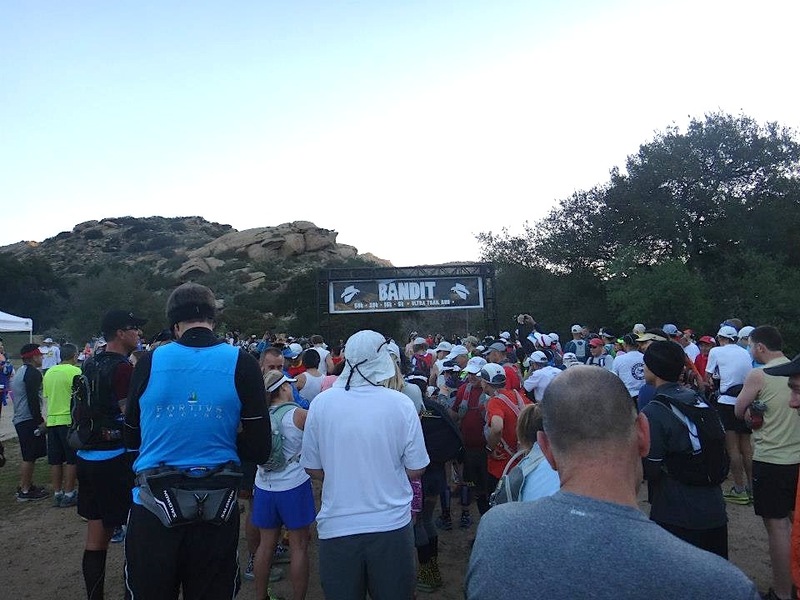 Whether I have DNFd or had succeeded to finish this event, this is just a part of the process of becoming a better and healthy mountain trail runner (which I may never know would prepare me to a more challenging trail running event). I travel to other countries to experience their trail races and be able to enjoy life to the fullest! But in the end, it gives me the best satisfaction if I could share these information and tips to those who are planning to experience joining these trail races outside of the country in the future. As what I’ve been saying, “If BR can do it, you can do it, too!” The experience is really priceless! Keep on running!!! Thank you for reading my 2018 TNF Lavaredo experience. God’s willing, I will be back to Lavaredo! I was in Los Angeles, California last February to attend the wedding of my son, John Paul. After the wedding, I had all the time to “peak bag” some of the nearby mountains near our house and had my daily runs of about one hour everyday. My “peak bagging” activities would cover not more than 20 kilometers in distance but most of these runs would cover 4-6 hours and my longest was 7 hours. 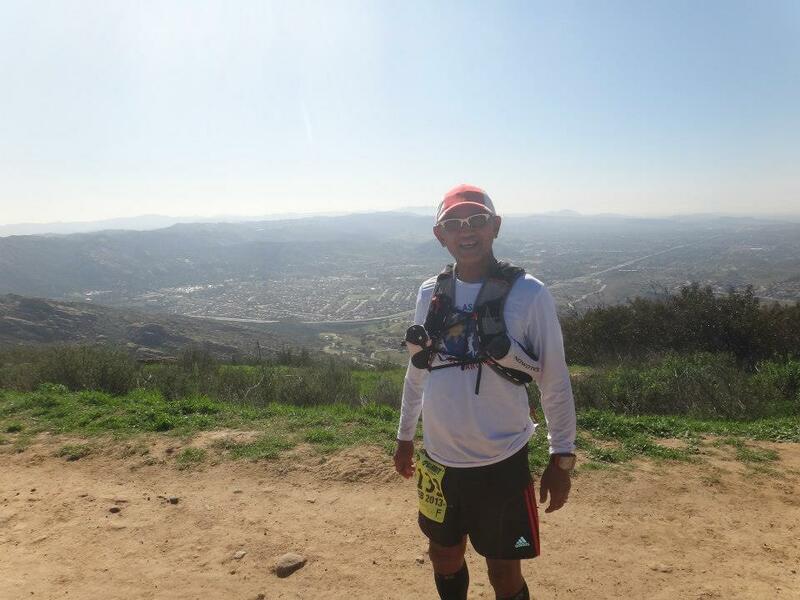 I was able to “peak bag” the Dante’s Peak @ Griffith Park, Verdugo Mountain, Echo Mountain and Mt Lukens through the detailed information from Ben Gaetos, an ultra runner friend who is based in Eagle Rock, California which is near Los Angeles. Separate posts will be published on this blog on my experiences on these mountains that I’ve visited. 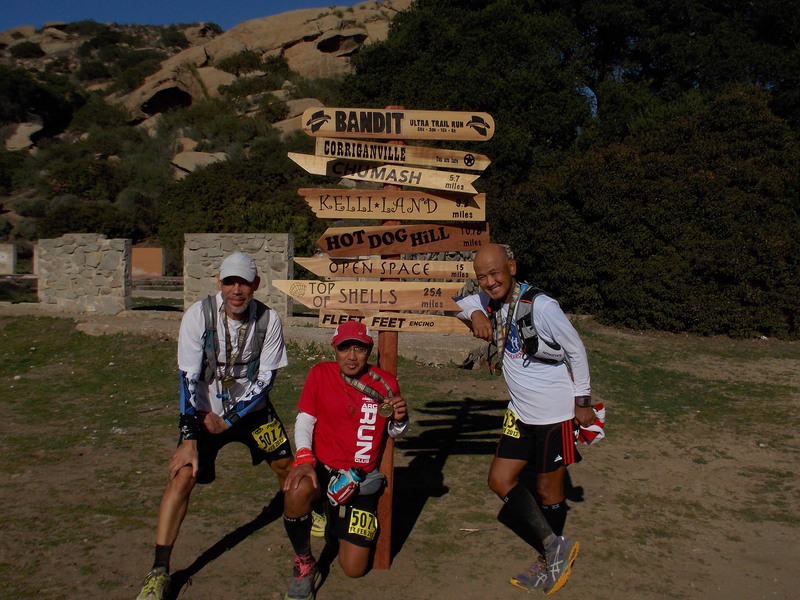 In one of my FB chats with Ben Gaetos, he mentioned to me that he is going to run the Bandit 50K Trail Run in Simi Valley, California which was two weeks to go before race day. Without any training and preparation for the said distance, I forced myself to join this event with the goal to finish the race within the cut-off time. 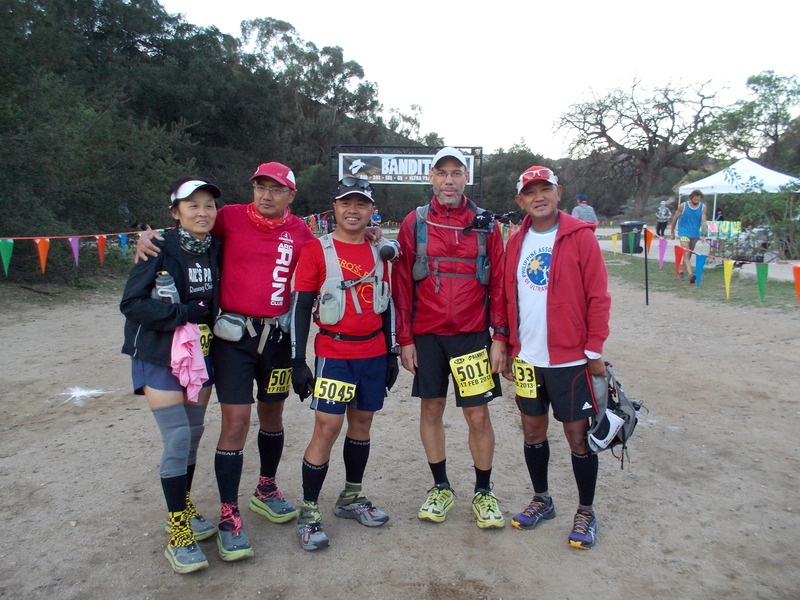 Gilbert Gray, an ultra runner from Maryland, USA and BDM 102 & 160 Finisher, saw my picture on Facebook with Joe Matias of A Runners Circle Store and Ben Gaetos having breakfast. I posted the said picture saying that the three of us were planning for something about ultra running in California. Gilbert might had been intrigued about my post and picture. He ultimately discovered that Ben and I were registered to run this race. 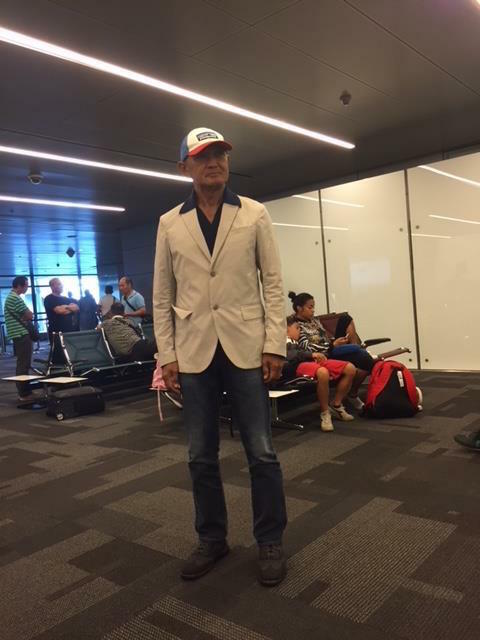 He immediately registered for the race and booked a flight to California with his wife. What puzzles me up to this time was when I found out that Gilbert Gray’s flight landed in Sacramento, California which is 500 miles north of Los Angeles. He drove from Sacramento and arrived at the race area barely 4 hours before the start time. What amazed me most was that he just finished a 100-mile race in Florida two weeks before this run and drove his car from Maryland to Florida and back. 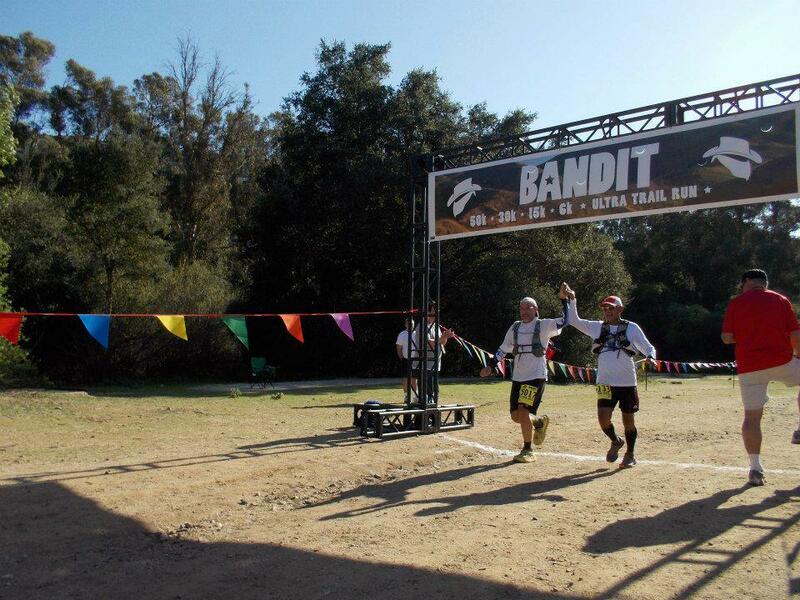 And after the Bandit 50K Race, he would drove back to Sacramento to catch up with his flight back to Maryland the following day! This is the reason why I call him, “The Machine”! The trip by car from our house to the State Park in Simi Valley was about 45 minutes and I was at the assembly area one hour before the start time. Runners would fall in line on their respective distance booth and the Race Packet and Loot Bag were given after stating your last & first names to the volunteers. Very easy and well-organized. After pinning my race bib, it was time to look for Ben Gaetos and Gilbert Gray. It was already daybreak when I was able to see them barely 30 minutes before gun start. It was some sort of a reunion and I was very relaxed with the expectation to finish the race within the cut-off time. Few minutes before the gun start, Ben Gaetos told us that we will see each other at the Finish Line which means that he is going to race and finish strong in this event. Gilbert and I positioned ourselves at the back of the pack and we both knew that it would be a long day for us on the trails! After a simple countdown, the race started at exactly 7:00 AM. Gilbert and I were at the back of the pack trying to warm-up with our slow jog but we can still see the runners in front of us. We went around the park on a wider trail for about a mile and then passed by the place where we started. After that short flat loop, we turned right into a wooden bridge and that was the start of almost 2 kilometers of winding single track trail going up to the peak of the mountain. 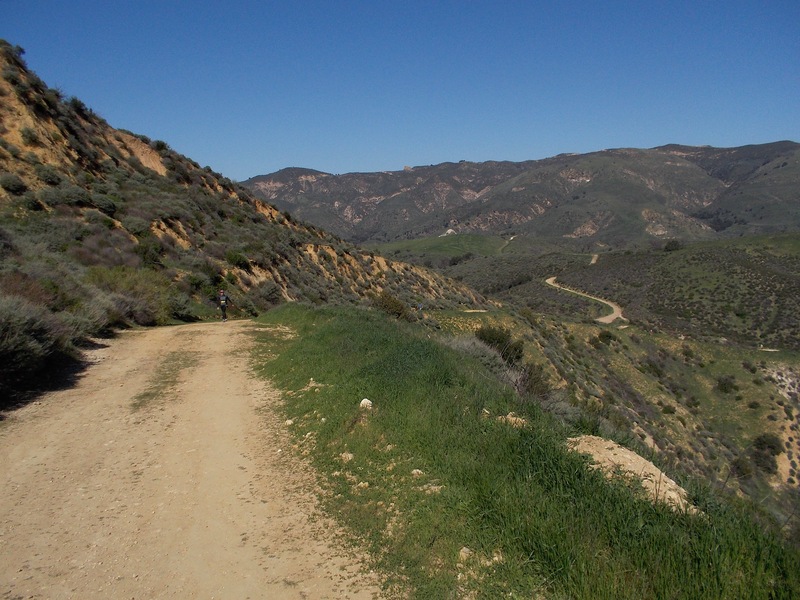 Gilbert and I started to power walk all the way to the peak where the first Checkpoint/Aid Station was located. On top of the ridge, the trail was on top of a mountain made of rock and we simply jogged on this part. After the exposed mountain rock, we followed a trail that brought us for some shade and vegetation until we went down from a mountain that leads to a subdivision/group of newly-constructed houses. We ran on the asphalted roads of this affluent neighborhood until we followed a road that goes to another mountain. Before going up to another mountain, this was where the 2nd Aid Station was set-up to serve a lot of food and drinks. This was where I saw boiled small potatoes were served with salt to dip on. From the 2nd Aid Station, we had to face another mountain which was exposed to the sun. It was hot during the day that I had to drink a lot. It was on this portion of the course that I thought I was dehydrated and tried to look for Coke for some “sugar rush”. It was only when we reached the turn-around point at the Km 25 that I was able to refill my bottles. This was where the 3rd Aid Station was located. But my mistake was not to take a drink from the ice-cold coke offered at the Aid Station. I relied on the electrolytes that I brought with me in my pack which was my first time to use. I was still strong from the turn-around point up to the 2nd/4th Aid Station. 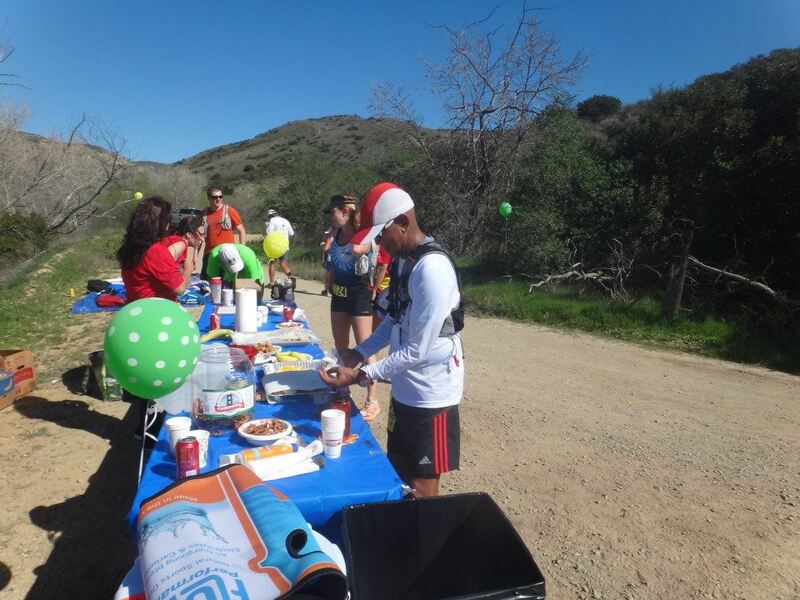 Gilbert and I ate some foods at the 2nd/4th Aid Station and we stayed longer to mix my drinks and engage short conversation with the volunteers and other runners trying to refill and eat at the said place. From the 2nd/4th Aid Station, we started to jog and walk but the heat of the sun was too much to bear but I tried my best to power walk on the inclines and slowly jog on the downhill parts of the course. 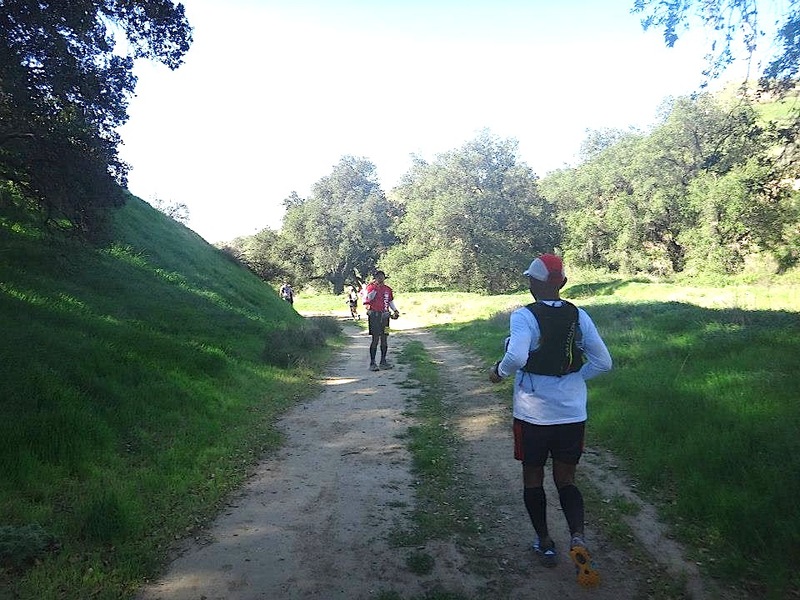 On our last 15 kilometers, I started to have cramps on my quads and I had to stop to stretch the affected parts and Gilbert Gray was there to see to it that I was fine. Slowly, we walked on a long stretch of uphill road to the top of the mountain and I was on survival mode! When we reached the peak of the long uphill road on the last mountain which is about 5 kilometers from the Finish Line, I thought I could no longer move my legs! This is where I analyzed my mistakes in joining this race. No decent “back to back” long runs and introducing a new electrolyte mix in this race! I told Gilbert that I have to finish this race and consider it as my long slow distance run even if I slowed down from my past 50K trail run in the United States. Gilbert was very patient with me as he would start a conversation that would boost my ego and morale. He would tell me that people with my age (60 years old) would be fat and sitting in front of their TV set and constantly visiting their medical practitioners for their health problems. As part of our brief rests, we would take some photos of us on the last few kilometers of the course. The 1st/last Aid Station was a blessing to us as we had the last cup of Coke and there was a towel soaked in an ice water which I rubbed on my head, nape and face. From here, it was our last 3 kilometers and we simply started to run on switchbacks going down the mountain (the first mountain that we peaked). Our pace in going down the mountain was so fast as if somebody was behind trying to overtake us on that single-track trail. Gilbert and I were excited to cross the wooden bridge where his wife was located trying to get a picture of us. At this point, we were 400 meters away from the Finish Line. At Last, Crossing The Finish Line! Few meters from the Finish Line, Gilbert and I held our hands up high until we crossed the Finish Line. We had an identical time of 8:07:19 hours, placing 119 and 120, respectively out of 140 Finishers. Ben Gaetos crossed the Finish Line one hour ahead of us. He was really fast on his way back to the Finish Line. If I have the chance to join this race again in the future, I would gladly prepare and try to improve my time and correct my mistakes. 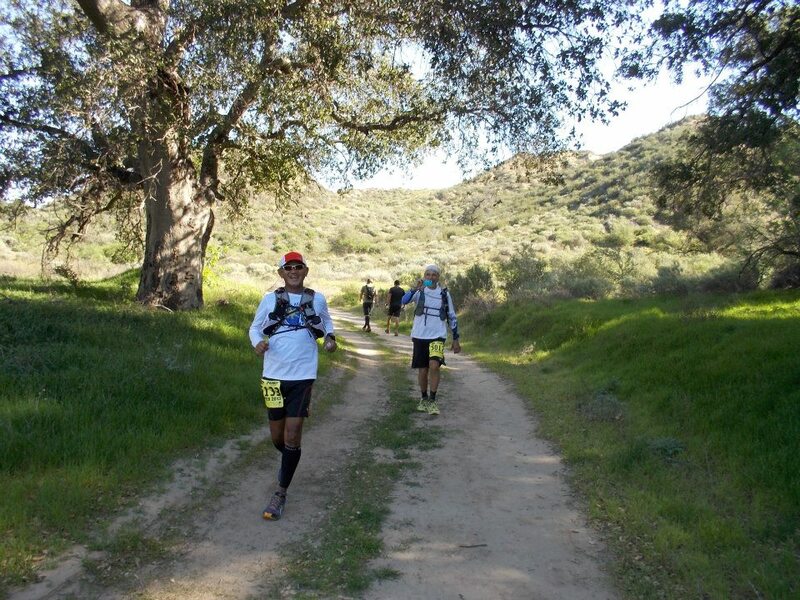 I am highly recommending this race for those who usually visit California and Los Angeles during the month of February. If you are interested to know more about this race, you can visit its website on http://banditultratrailrun.com. In connection with the celebration of the 50th Founding Anniversary of the Special Forces Regiment of the Philippine Army in June of this year, the Philippine Association of Ultrarunners (PAU) & Bald Runner’s Events had scheduled the conduct of three (3) trail races inside Fort Magsaysay in Palayan City, Nueva Ecija on June 2, 2012. 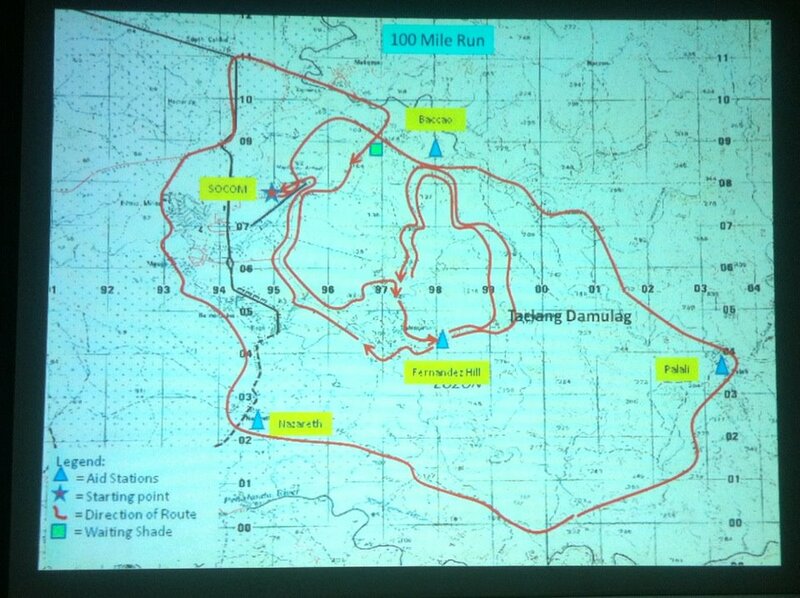 These races will serve as a “recon or test run” for those who are intending to join in this year’s 2nd edition of the Taklang Damulag 100-Mile Trail Endurance Run which is scheduled on December 15, 2012. ***Included in the Registration Fee: Dinner & Accommodation Inside Fort Magsaysay on Friday night, June 1, 2012. Good luck & see you at the starting line! Ryan Sandes takes Vibram Hong Kong 100 title in new course record despite fierce Nepalese assault- Andre Blumberg reports. The second edition of the Vibram Hong Kong 100 took place 18 – 19 February 2012 and has already established itself as one of the region’s premier ultra events. The HK100 entered the scene only last year and is still the only 100k solo distance race in Hong Kong. Perhaps not surprisingly, and well in line with the global explosion of ultra popularity, the registration rates skyrocketed to over 750, or about four-fold in just one year, and the race sold out almost three months in advance and without any significant advertising. Hong Kong may not be the first place that comes to mind in the context of ultra trail running. 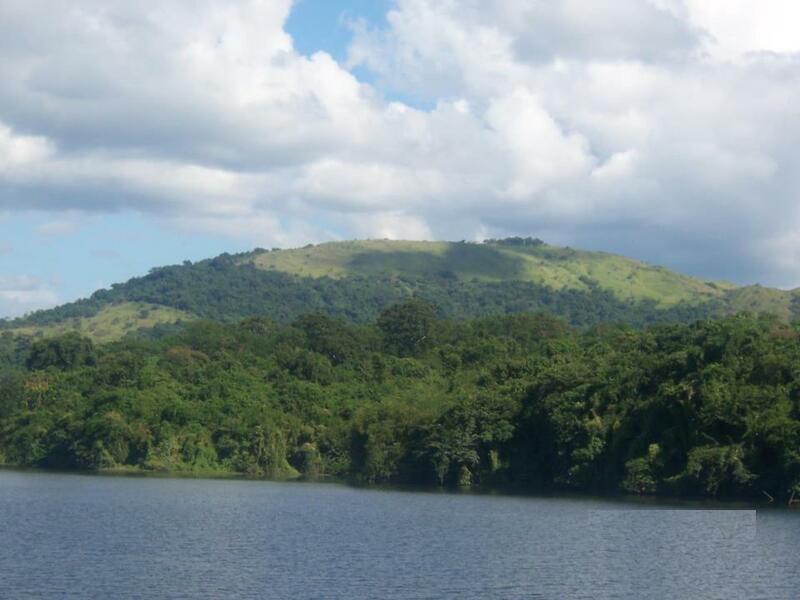 However the city has a lot to offer, including four long-distance trails and numerous shorter trails in the various country parks. The HK100 course follows the famous MacLehose trail but with a few modifications to make it even more scenic and interesting. The start is in Pak Tam Chung and the course then stretches through the Sai Kung country park along beaches and mountains to continue into the Central and Western New Territories of Hong Kong to finish with a descend of Tai Mo Shan, Hong Kong’s tallest mountain at 957m. 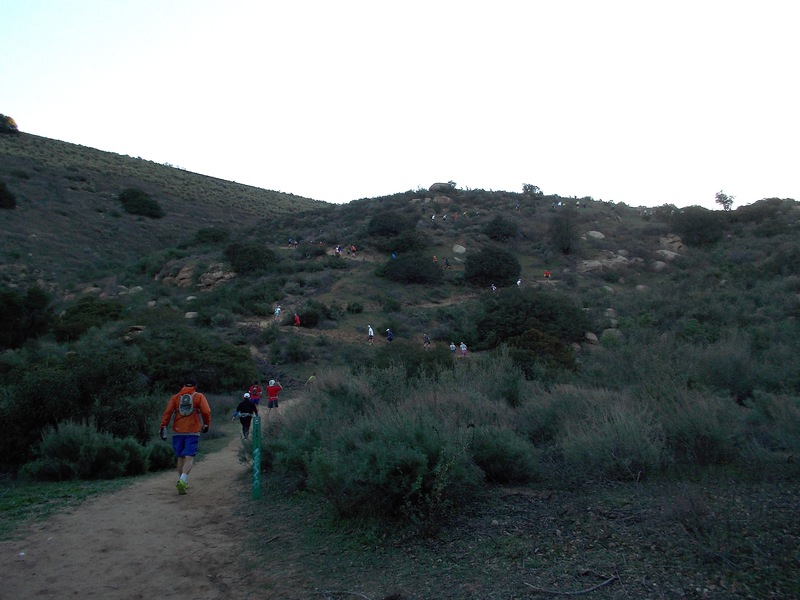 The course has an elevation gain of over 4,500m which includes literally thousands of stairs. When compared to TNF100 Australia in the Blue Mountains, the consensus among those that have run both seems to be that HK100 is a lot harder and less runnable. The organisation of the race was once again flawless. 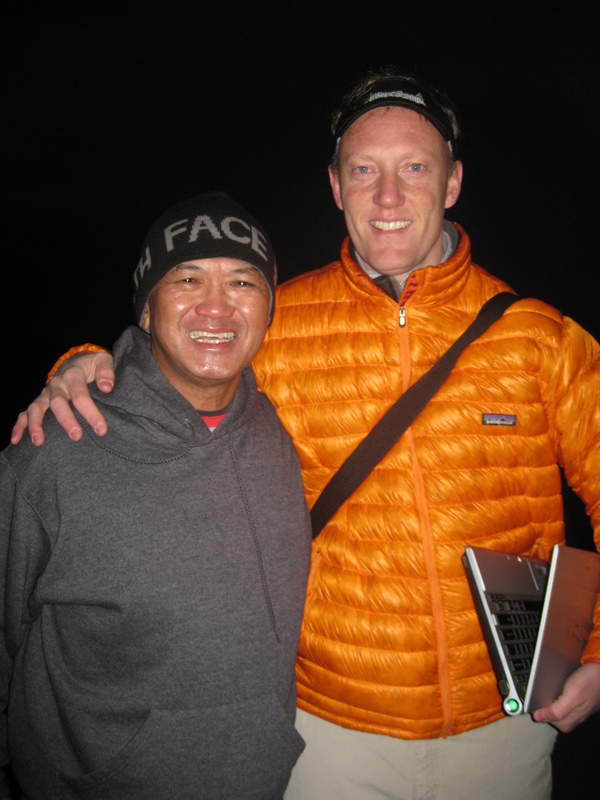 Race Directors Janet Ng and Steve Brammer, a lawyer and a banker by trade, are both seasoned ultra runners who have participated in events worldwide. This year Janet will race UTMB whilst Steve and one of his buddies will join the PTL, a 290k, 22k D+ event. So the HK100 truly is an event by runners for runners. It is often the little things that make a race stand out, for example an amazing ratio of less than two participants per every one volunteer along the course and at the aid stations. Two aid stations were operated by kids from a scouting organisation and the vibe and motivation of the kids was absolutely infectious. 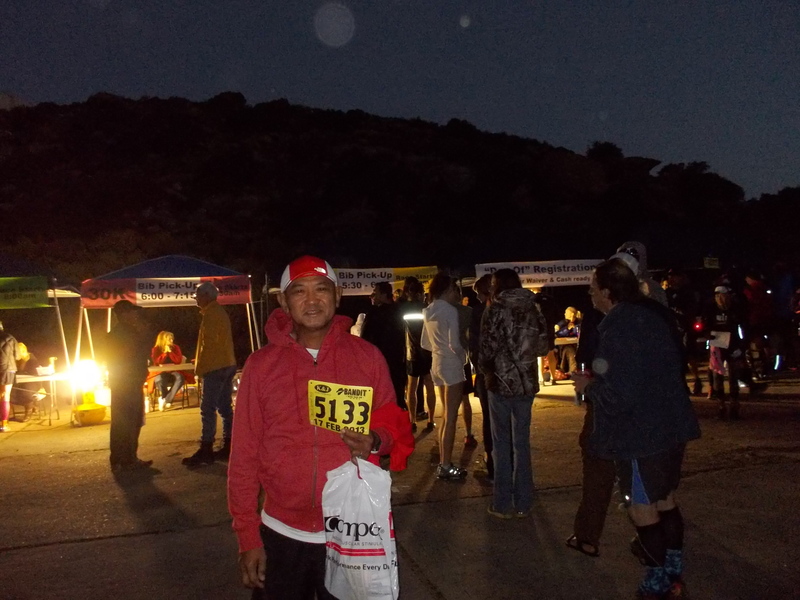 The course was well-marked with well-stocked aid stations approximately every 10k. The weather conditions were perfect, temperatures around 10 – 18C and humidity around 65 – 80%, fairly low levels by Hong Kong standards. Participants could enjoy the most stunning views across Hong Kong’s peninsula. One of the more unique aspects of this race is the very generous cutoff time of 32hrs which is a lot compared to other 100k events; in fact it would more commonly be associated with a 100 miler. The rationale is to enable a broad range of participants from all walks of life to participate, including those that prefer to hike a 100k solo effort. Regardless of the lavish cutoff times, the event still recorded a DNF rate of about 20% which shows just how hard the course really is. This is not to say that the race was slow – nothing could be further from the truth. The field was deep and stacked with talent. Salomon International sent Jen Segger from Canada, Grant Guise from New Zealand and Ryan Sandes (winner of all 4 Deserts races and 2011 winner of the famous Leadville 100) from South Africa. Then there were the top Nepalese mountain runners Aite Tamang, Bed Sunuwar and Sudip Kulung who all finished on the podium at the recent Annapurna 100 in Nepal. China’s top ultra trail runner Yun Yan Qiao 运艳桥 joined as well (2nd at 2009 TNF100 Singapore, 2nd at 2011 TNF100 China and 14th at the 2011 CCC in France). Most of the notable local Hong Kong ultra runners also participated; including last year’s first and second William Davies and Jeremy Ritcey, respectively. Dan Parr and Eric LaHaie toed the line, both with excellent Racing The Planet event credentials. Unfortunately “Stone” Tsang Siu Keung was unable to join due to injury. On the female side Hong Kong-based Nora Senn and Claire Price signed up, last year’s runner-up in the 100k solo and winner of the 100k duo. Claire finished 4th at the 2011 TNF100 Australia and an outstanding 2nd at the 2011 CCC. Olya Korzh, who did very well in a number of local mountain marathons this season, as well as Xing Ruling 邢如伶 from China (1st in 2009 TNF100 Singapore and China, 1st 2010 Taklamakan 100k) rounded out the top prospects. Australia was well represented with Andrew Dawson, John Ellis, Keith Mearns and Michael Ormiston, all currently resident in Hong Kong. Richard Mountstephens and Matt Meckenstock came up from Australia specifically to participate in the event. Having participated in a number of ultras in the Philippines, I was very keen to have some of their talent join the HK100 to get some international exposure and therefore sponsored Raul Lamprea and Jucell Laya. 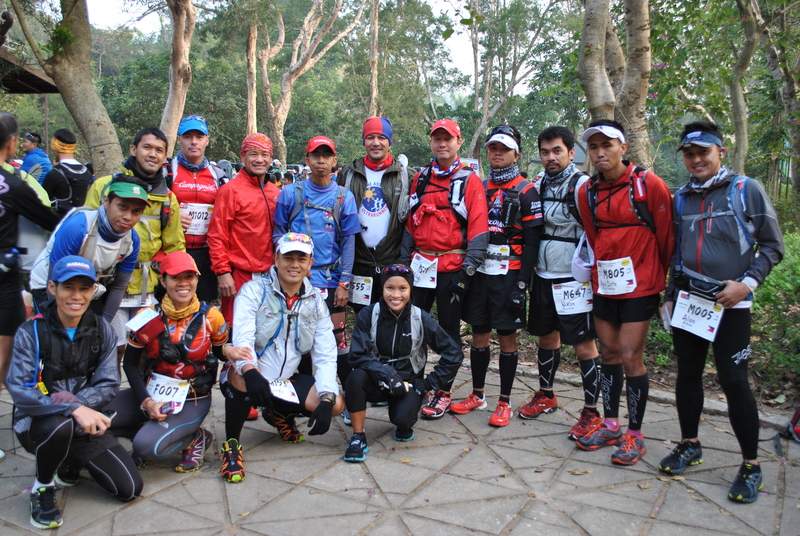 Both are members of the Philippines Army and the Bald Runner Ultra Elite Team, run a 2:40 marathon time and it was the first time for them ever to travel overseas – a great experience with many lessons learned. Come race day the starting area was absolutely buzzing with runners, everyone seemed to be in a great mood and it was truly an international field with 28 countries represented. After a short race briefing the gun went off at 8am and the pace at the front was ferocious. The course only has around 600m of wide road at the start before turning off into single-track for several kilometres, so everyone was keen to speed up in order to not be bogged done there. I had done the inaugural 2011 HK100 in a time of 13:51 which placed me 10th overall and my target time was 13:30 since I only had about six solid weeks of training in my legs and had completed TNF100 Thailand in 2nd place just two weeks earlier. After the start I was hanging with the lead field for a short while but quickly backed off since the pace was not sustainable for me. I settled into a good rhythm and ran with Keith Mearns for the next two hours or so. I felt pretty good all day apart from the usual minor lows and my two-pack strategy worked well to reduce any unnecessary layover time at the check points. Paper, my girlfriend and crew chief-of-staff, had all the routine worked out based on the prior year and welcomed me at each of the accessible support stations during the first half for bag swaps, some motivational words as well as taking plenty of pictures along the way. By the time the 52k check-point came around I was ahead of plan by 30 mins and at that time decided to change the target to go sub-13, previously considered an absolute dream time for me. All I had to do from now on was to execute based on my plan and maintain the 30 mins lead. It was pretty rough at times going through a few lows and I had to constantly remind myself to persist with relentless forward progress. I was pleased to see that my ultra experience thus far paid off and I started to take positions by benefiting of the evolving carnage around me, runners that went out too fast for their abilities and then spent too much time at support stations. On the other hand I was not overtaken for several hours, except when Nora Senn stormed past just prior to the 65k mark. Despite trying hard, I was not able to hang with her and had to let her move ahead. Later on coming down from the notorious Needle Hill at around 86k into the race, I was surprised to catch Matt and Jen who was suffering from the concrete surface of the course. After a short chat with them I carried on to hit the 13hrs mark and then brought it home in 12:50, over an hour faster than last year which I was extremely pleased about. In the meantime, Nora went on to catch Claire and finished in a Senn-sational 12:34 followed by Claire in 12:40 and Jen rounded off the female podium in 13:01. Sometimes I wish not to race in an event, just so that I am able to follow and witness the lead pack go about their business. This year’s HK100 would have been such an event. The pace was fast from the start and surprisingly not a lot changed in the ranking between early on in the race and the finish after 100k. The Nepalese runners Aite and Bed took an early lead and managed to hold on until somewhere between CP6 and CP7. At that time Ryan Sandes took the lead and then brought it home in an absolutely astonishing 9:54hrs, almost two hours faster than last year’s record by William Davies. But Ryan was not alone: remarkably, all of the Top 10 finishers broke the course record, including William himself. Aite finished second in 10:17, followed by Bed in 10:26 and Jeremy Ritcey did Hong Kong proud in 4th and a blazing 10:47. Andrew Dawson (12:30), John Ellis (12:34) and Richard Mountstephens (12:40) were the top Aussie finishers. On the Kiwi side we had Grant Guise in 10th place (11:45) as well as Callum Stowell (13:22) and Denis Kelliher (17:56). 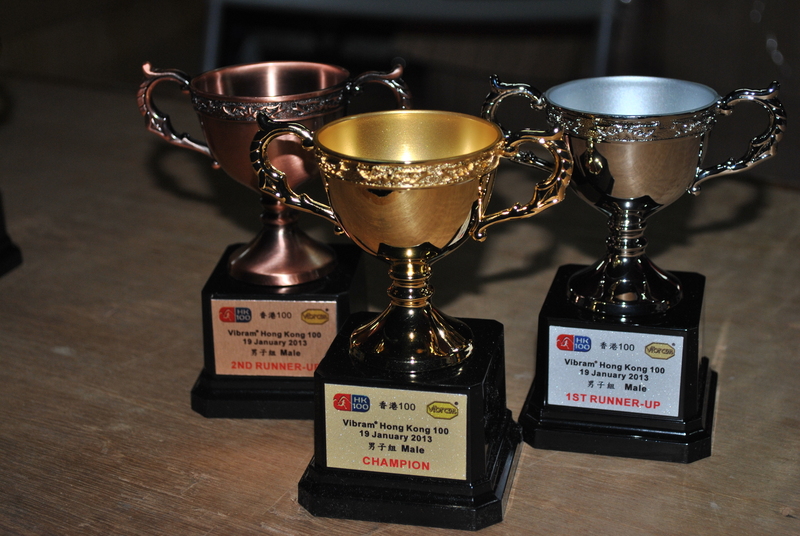 Full HK100 race results can be found here. Ryan Sandes clearly has left a mark on this race. Going sub-10 on this course it truly remarkable, especially since the season is only just starting. 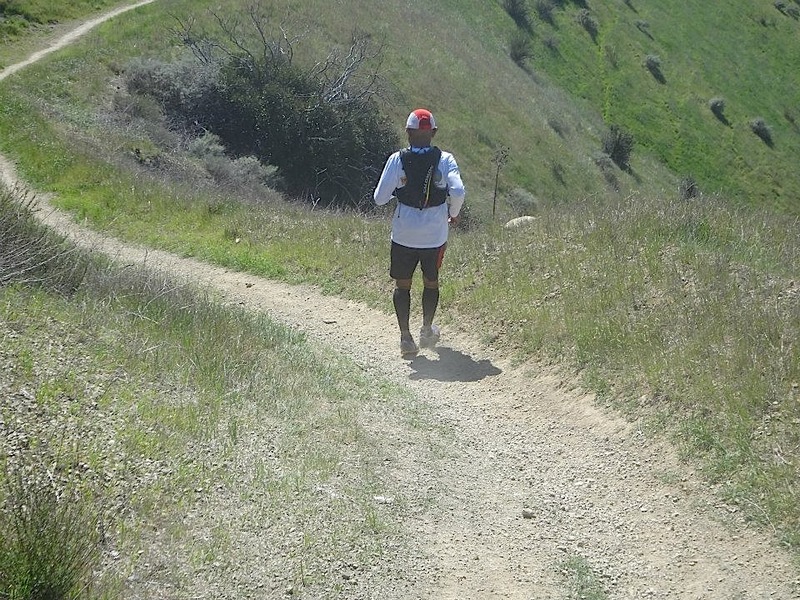 Ryan didn’t even run all the uphills as you can see in this short video here, but he surely is blazing the downhills – he probably studied Dan’s related Ultra168 article. So – well done, Ryan. For those racing TNF100 Australia in May, brace yourself for the potential of a new course record. But HK100 was more than just about the top winner. It was an interesting case study in how the ultra world may be changing in future. To have the three Nepalese participants Aite, Bed and Sudip finish in 2nd, 3rd and 8th place is a clear signal that we are only seeing the tip of the iceberg here in Asia when it comes to top performances. 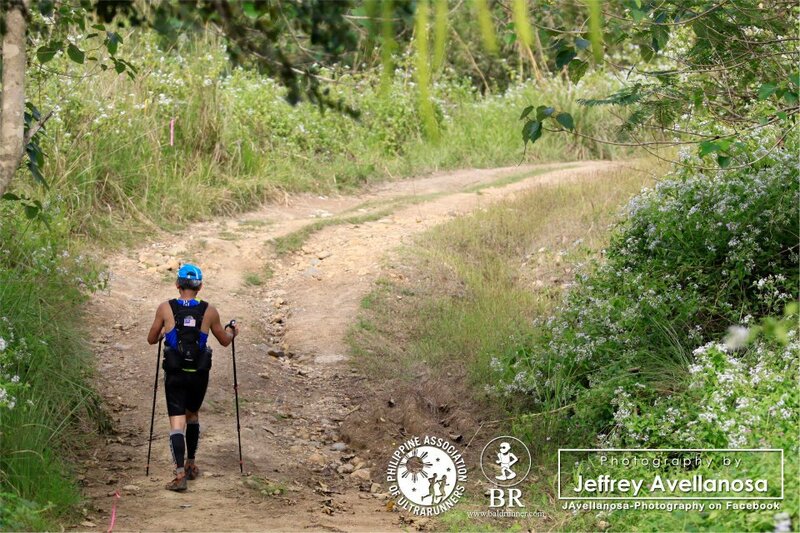 There are many untapped “markets”, such as Nepal and the Philippines, with a range of top talent that has yet to hit the international ultra trail event scene. The difference in background between the Salomon team and the Nepalese team could not be more pronounced. Ryan is a professional ultra runner, has multiple sponsors, access to Salomon R&D for customized kit and accessories, latest training methods and presumably a number of trainers and coaches. Two of the Nepalese runners are in the Army, the third worked as a porter. They get by on very limited means. They have no regular sponsors, no expensive kit. They do have a lot of talent and a certain level of ignorance, innocence, almost purity – and I mean that in the best possible way. While the Salomon team held trail clinics and product demonstrations in the days leading up to the race, the Nepalese walked along the course to prepare for the race. Despite the vastly different backgrounds, the top three finishers only separates a bit over half an hour with Aite and Bed coming in second and third. I was very fortunate to share dinner with the Nepalese team and their coach Ramesh after the race, and came to the conclusion that despite all the differences in background, financial means, equipment and training methods we all share one thing: a deep passion for ultra trail running. Feedback from the participants of the HK100 was outstanding across the board. Clearly, the event moved from good to great and it sets a new benchmark for ultra trail races in the region. Well done Janet and Steve – when will registrations open for your eagerly awaited third episode? Taklang Damulag 100-Mile Trail Endurance Run (TD 100) is already one of the Ultra Races being administered by Mark Gilligan of Ultra Signup. If you are used and familiar in registering to International Marathons, most probably you have experienced registering your participation through www.active.com. For Ultra Trail Races in the United States and other countries, registration of participants are done through Ultra Signup. 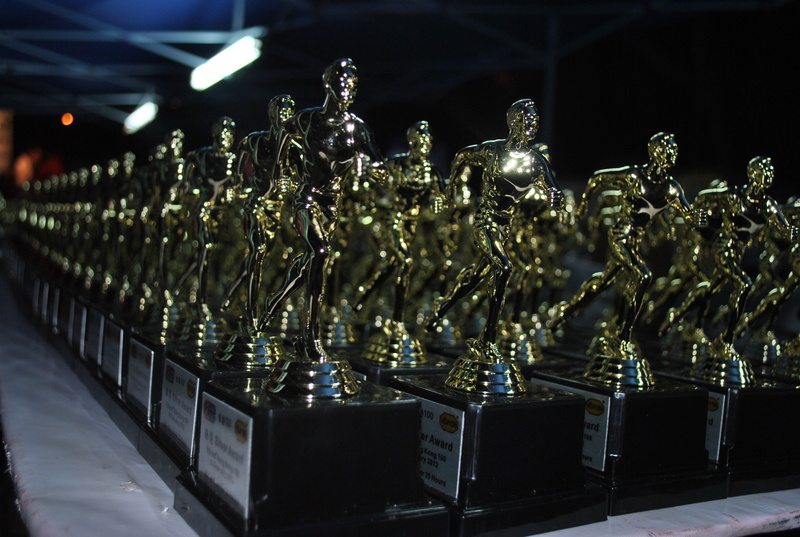 TD 100 is the FIRST Ultra Race in the Philippines and Southeast Asia to be under the processing of Ultra Signup. Lately, I registered for the 2012 Cobra Half-Ironman Triathlon and I was charged with a registration fee of $ 225.00 (US Dollars) plus $ 16.00+ (US Dollars) as Processing Fee, a total of $ 241.00+ for my participation in the event. In comparison with Ultra Signup, it does not charge additional processing fee for the registration fee. So, if you are interested to join this event, you will be charged with the stated registration fee ONLY.